Did you know that there is an art form that is completely easy and accessible to start, but that has unlimited capacity for increased complexity? Or even weirdness? What could be easier than stitching beads onto fabrics, creating a world of color and texture and emotion? Of course as time goes on, you find yourself wanting to add a whole bunch of other things besides just beads, and sometimes you also find yourself stitching onto materials besides fabrics... And so it goes. 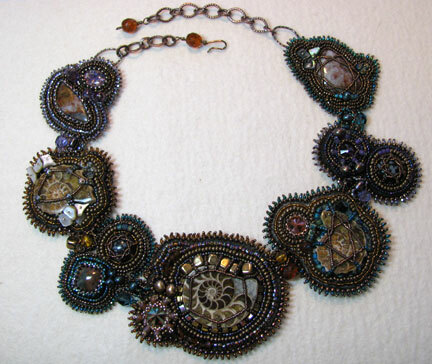 Mixed media bead embroidery has no boundaries, and sometimes it gets complicated. So why bother? I mean, beadwork can be a ridiculously painstaking medium for self-expression. Not all artists have the level of obsessive attention to detail to choose this path. But those who do are rewarded beyond measure. Not only by the work itself, but also by the inclusiveness of the amazing community of beaders. There is always room for more members. My goal is to help you find your way into this fabulous art form. Creating innovative mixed media bead embroidery is my passion, and I want to share it with you. 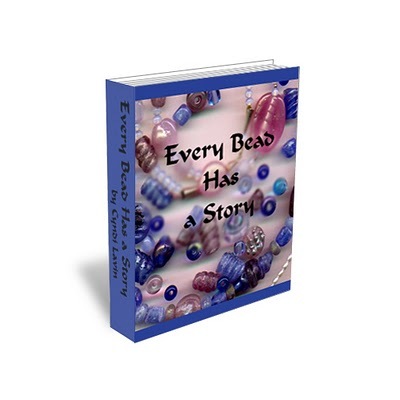 In fact, the first chapter of my e-book Every Bead Has a Story is free. You can download it to see if this is a journey you'd like to take. It covers my favorite materials, tools, and stitches, plus it has a beginner project. Additional chapters focus on altered surfaces, dimensional beading, found objects and unusual materials, and integrating bead embroidery with other fiber arts. Chapter 4 is free with the purchase of the first three chapters, even if you don't buy them at the same time. Upon confirming your purchase, I will email the final chapter to you at no extra cost! 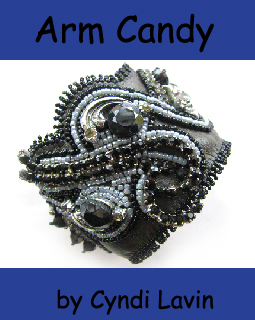 My second e-book started out as just a little booklet to teach some handy bezeling methods for bead embroidey. I was wrong though...there was much more to say! 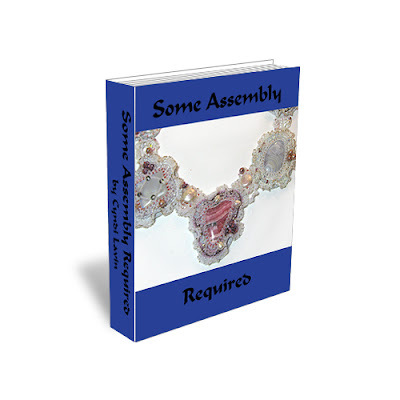 Some Assembly Required covers bezeling many different sizes and shapes of cabochons, unifying your piece by adding texture, attaching all the pieces together, and putting all the finishing touches onto your necklace. My third e-book grew from my desire to more fully use beadweaving stitches in my bead embroidery. Bored By Back Stitch teaches you how to create twelve different bead embroidery motifs, using nine different beadweaving stitches. You'll learn how beadweaving stitches can be morphed into beautiful bead embroidered motifs, created to surround and enhance your cabochons or accent beads, and to fill any open spaces in your bead embroidery designs. Later chapters add more stitches and textured surfaces like shibori pleated silk ribbon, metal mesh ribbon, and soutache braid to the mix. Thanks to having a huge collection of vintage jewelry, much of it broken, I was inspired to work obsessively on integrating broken treasures more fully into mixed media bead embroidery pieces. What fun it was to make these bracelets, and it's even more fun to wear them! Arm Candy will show you how to upcycle and attach just about anything to your own work. Cyndi Lavin's new e-book dishes out detailed information on beginning bead stitching served up with a generous helping of beautiful pictures that will guide the reader through every step necessary to master each stitch. The gallery designs and accompanying project are positively inspired and Ms. Lavin's considerable expertise and friendly voice make you feel as if you too can master this medium. This is the first of what I know we all hope will be many more e-books showcasing her amazing gift of beaded embroidery. I have always coveted these sorts of beaded collars, but had no idea until now where to begin and how to improvise. Cyndi explains to you how to do both. I had a chance to read through the book and love how she wrote the instructions. It feels like she is right there talking you through it.